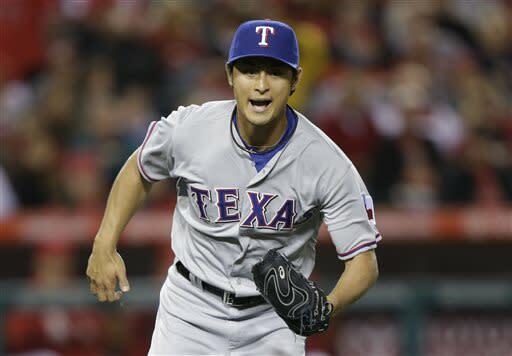 ANAHEIM, Calif. – Yu Darvish on Wednesday night made his fifth start of the season, the 34th of his career on this side of the ocean, and after three innings a veteran scout tapped into his phone, "Darvish might have the best slider I've ever seen tonight." Not Darvish's best slider. Anybody's best slider. Of the tens of thousands of sliders this scout had witnessed, recorded and committed to memory, the best slider. That one. And Darvish has, like, a half-dozen other pitches. Several hours earlier, a more veteran scout (by perhaps 20 years) listened attentively to the clumsily phrased question: "How many pitchers have you seen with both the quantity of pitches and the quality of pitches possessed by Darvish?" He got the gist, formed an O with his thumb and forefingers, and grinned. In the fourth inning at Angel Stadium, Darvish's former teammate, Josh Hamilton, came to the plate with two outs. The first pitch was a 60-mph curveball. Hamilton swung over it. Darvish got the ball back and stared in. 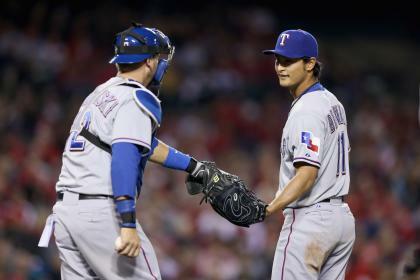 Darvish's catcher then went to the mound. "I put down all 10 signs and he didn't want any of them," A.J. Pierzynski later explained. The second pitch to Hamilton was a 98-mph fastball, which Hamilton took for a ball. In between the two, you could have fit the speed limit in most residential neighborhoods. By the merciful end of a thorough AL West thrashing here, Darvish had gone six innings (extending his scoreless streak to 18 innings), allowed three hits and two walks and struck out 11. By eyeball count, Darvish threw 47 sliders in his 100 pitches. Twenty-seven of the sliders were swung at and missed (plenty by a foot or so), or taken for strikes, or fouled off. Six were put into play, only one of them with some authority. That's the thing about barely hittable pitches, too, and the reason Darvish could be so dominant and yet be excused with still three innings to go. (That and the 11-run lead with which he departed.) That is, so few are put into play, Darvish has to throw lots of them. Through five starts, he's struck out a major-league best 49. Only once in five starts has he lasted more than seven innings – he retired the first 26 batters of his first start, only to lose the perfect game and the no-hitter – and still he's struck out at least 10 three times. And that leads us to perhaps a reasonable inside-the-numbers comparison to Darvish. Derek Lowe, who's in his 17th season and coming up on 40 years old, swears he's seen something like Yu before. The variety of pitches, the velocity, the savvy, the heartlessness of it all and the resulting workload, it reminds Lowe of Pedro Martinez. "People talk about all the high pitch counts," Lowe said, "and I go to Pedro. His stuff is so good they can't hit him. Pedro used to say, 'I throw every pitch expecting them to hit it. When I throw it over the plate, they're probably going to hit it. Then they don't.'" So, he'd throw another. And another. Kind of like Darvish. Martinez won 219 games, won three Cy Young Awards and is going to the Hall of Fame. Darvish just got here, has won 20 games (and lost 10), and isn't yet in Martinez's universe. But, similarities exist, according to Lowe. "Yu's got six pitches, at least," Lowe said. "I marvel at that. I mean, just knowing when to throw a certain pitch." The game's best pitchers can throw a handful of pitches, but few absolutely command more than a few. Darvish can. On Wednesday night, he did not throw a splitter or a changeup. He threw a few cutters, a few more curveballs, and rode his fastball and slider. And the Angels had no chance in a game that eventually ended at 11-3. Scouts, managers, teammates and opponents agree Darvish is better this April than he was last season, when he came to the U.S., adjusted to the baseball and the routines and the deeper lineups and won 16 games, had a 3.90 ERA and struck out 221 in 191 1/3 innings. Against the Angels, a single baserunner appeared to be an act of mercy. "He's coming out of the bullpen knowing what he has working," Rangers manager Ron Washington said. "He's not trying to throw everything he has. What I think we're seeing is the type of pitcher he always was. It just took him half-a-year." In 13 starts since mid-August, Darvish is 10-3 with a 2.10 ERA. In 90 innings he has 116 strikeouts. The veteran Pierzynski, new to the Rangers, said he strategizes with Darvish the afternoon of his starts, then again after Darvish warms in the bullpen. And even then the game can go in unforeseen directions. Wednesday was the slider and the fastball. Next start? They'll see. "I've never been around a guy who has as many pitches and as quality pitches," Pierzynski said. "He has six or seven pitches. Most guys have two or three." By midway through the third inning here, by which time he'd struck out Mike Trout, Howie Kendrick, Chris Iannetta and Luis Jimenez with sliders, Pierzynski had found his pitch. "He's got one of those sliders that just stops and makes a right turn," Pierzynski said. "When he's on he's as tough as anybody I've ever seen." Darvish said afterward that his second full season with the Rangers has brought greater comfort. Specifically, he said, he knows "how things are run here." He said he's even getting a feel for Pierzynski, who has caught four of his five starts and is regarded as a headstrong catcher. Asked how long it takes a catcher, even one as time-worn as Pierzynski, to sort through his ‐ Darvish's – array of pitches and preferences and moods, Darvish grinned. "I had a catcher that caught me throughout my career in Japan and I still shook him off many times my last year in Japan," he said. "I'd heard about A.J. I must say he had a pretty bad reputation in my mind. I found on the contrary, he's a good person, a very good catcher and very mature. On the whole, he treats me like a parent treating a child, in a good way. … I felt very comfortable from the beginning." At 26 years old, 34 starts in, he's actually still in the beginning. That's what's so impressive. He's just now figuring it out. Soon, he'll be the one running things here.